This weekend Gabby & I were able to get into the agility trial in Glen Carbon and we did AWESOME!!! I am very pleased how fast Gabby is running now and someone even made a comment saying, "Woah - that springer actually is fast compared to most!" Gabby and I came home with 3 1st place wins (2 Jumpers w/ Weaves, 1 Standard) and 1 2nd place win (Standard) and we now have the 3 qualifying legs to earn a new title - Novice Standard Preferred! 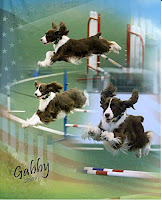 The agility trial photographer got a few good pictures of Gabby flying over the jumps, and was able to put a little collage together for me! And here is a picture I took in the backyard with all her ribbons!